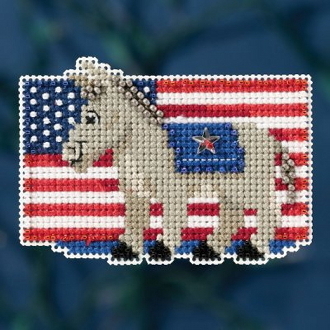 A lovely Patriotic Ornament design to cross stitch featuring an American Flag with a Donkey. Adorn with the enclosed Mill Hill star treasure. Makes one ornament to hang or use the enclosed magnet to decorate any metal surface! Finished size: 3.25"w x 2.25"h (8.3cm x 5.7cm).